Facebook’s rules about banning white supremacy but NOT white nationalism were released online, raising more questions than answers. What should the company’s role be in controlling hate speech? How the Klan appealed to Protestant America. A production of the Way of Improvement Leads Home, a blog dedicated to reflections at the intersection of American history, religion, politics, and academic life. In this episode of (w)Holy Media, I speak with Kelly J. Baker on the historical relationship between Protestantism and white nationalism and how it relates to the current political climate. Kelly J. Baker is the editor of Women in Higher Education, a feminist newsletter, in its 26th year, with the continued goal “to enlighten, encourage, empower and enrage women on campus.” She is also the author of the award-winning book, Gospel According to the Klan: The KKK’s Appeal to Protestant America, 1915-1930. Writer and historian Dr. Kelly J. Baker discusses her insights into the Ku Klux Klan as a reflection of Protestant America’s deep-seeded racism. Dr. Richard Newton and his Ethnicity, Gender, and Religion seminar speak with Dr. Baker about her award-winning book, Gospel According to the Klan: The KKK’s Appeal to Protestant American, 1915-1930 (University of Kansas Press, 2011). Many of us only know about the white supremacist group the Ku Klux Klan through film and television, and much of what we see blurs fact and fiction. Distinguishing each side of that messy divide is the prolific Kelly J. Baker, exploring how media portrayals of the hate group have influenced audiences and, in turn, fed back on its own members. 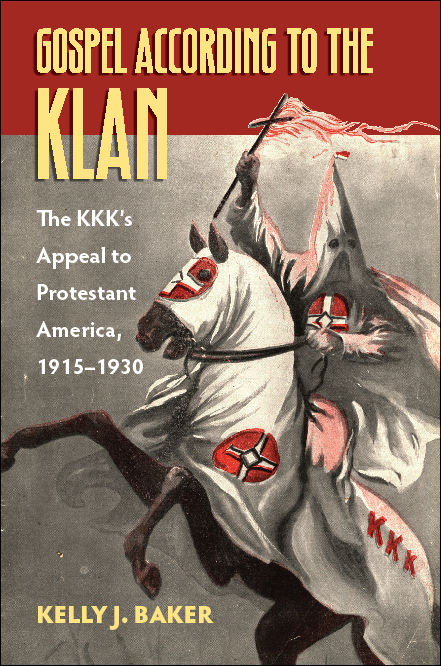 The imagistic association of one particular piece of clothing to a group ideology is one of the trajectories that Kelly Baker takes in her recent book, The Gospel According to the Klan: The KKK’s Appeal to Protestant America, 1915–1930, published by the University Press of Kansas. In her clearly written, meticulously researched prose, Baker notes the role of media (including newspapers, novels, and pamphlets, but also hoods, robes, parades, crosses and flags), and how the spectacle of these symbols communicates the ideals of a Protestant, white supremacist nation. Ultimately, rather than leaving all this in the past, Baker draws upon currents coursing through U.S. religious culture over the past three centuries. If images of white robes, pointed hoods, and a burning cross represent racism and violence for you then you are not alone. But do they also evoke ideas of nationalism, Protestantism, and masculinity? In the early twentieth century, the second incarnation of the Ku Klux Klan tied their faith to patriotism and in the process produced a unique self-fashioned religious identity. Dr. Kelly J. Baker received her Ph.D. in Religion with emphasis on the hate movement, religion and material culture, and religion and gender (specifically masculinity)….Her new book The Gospel According to the Klan is forthcoming.